The group camp out this year was in Swan Hill. The sites visited included Goschen, Swan Hill Water Treatment Plant, Lake Tutchewop, Round Lake and Lake Boga. A questionnaire was sent to the group and their responses are below. What was your best experience of the weekend? 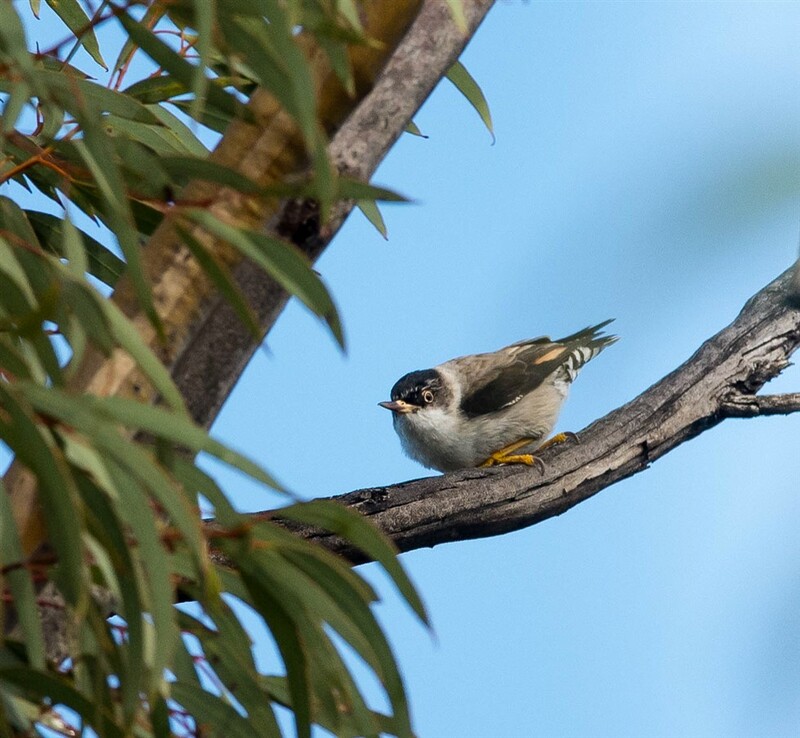 Variety of birds seen and learning from more experienced birders /Getting to know two new friends and spending time with them in the field./When the late night music stopped near the caravan park/Photographing the Variegated Fairy Wren/Visiting Goschen/Seeing Goschen come alive with bird activity after the thunder and lightning/rain/Loved the Goschen Bushland reserve – so peaceful and productive/Seeing the sun come out after the thunderstorm on Saturday morning. We were very lucky to have good weather for the rest of the weekend./Goschen Reserve best location. Really enjoyed camaraderie of the group./Goschen Reserve, I had not visited previously. 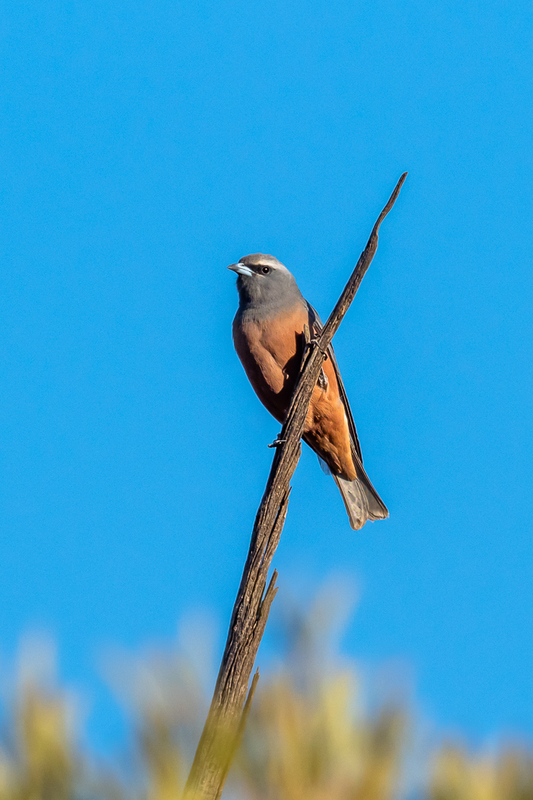 It was great to see such a diversity of bird life in such a small area of bush-land. The mornings and evenings were very beautiful for photography where you could walk from front to back of the reserve and catch the low light on the bird subjects enhancing their images. 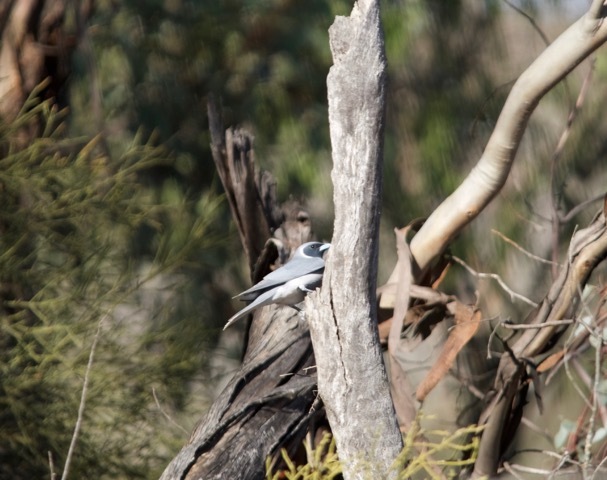 Wood-swallows and Hooded Robins were seen in large numbers giving many opportunities to photograph them./Standing around in one small part of the Goschen Bushland Reserve watching almost at eye level all the bird behaviour continuing as if I wasn’t there – with the surround sound of their calls. 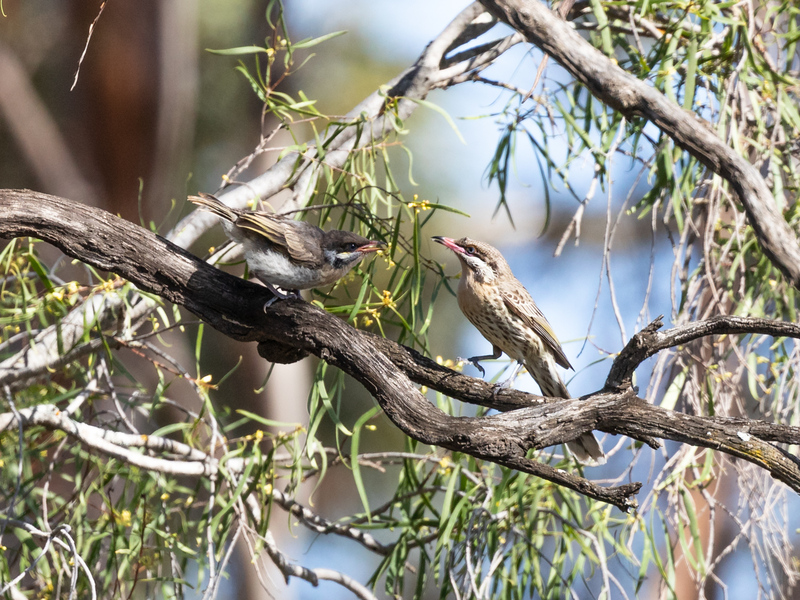 Such a diversity of bird species; red capped robins (female and immature male) feeding on insects, hooded robin male being chased by striated pardalotes, striated pardalotes preening on higher tree branches, a pair of weebill foraging through the hanging leaves, spotted pardalotes continuing to dig a ground nest hole near a small wattle which they used as a lookout post, masked woodswallows perching, feeding and mating in low mallee trees, red-rumped parrots flying in and feeding on the grass seeds, a white winged triller female fossicking through the grasses and fallen branches, a pair of rainbow bee-eaters fluffing their feathers up while resting on branches between aerial feeding bouts, a singing honeyeater foraging from the ground to the trees and sitting on higher lookout sticks preening, a party of white-browed babblers moving upwards through a dense bush before flying out one after the other off into the next then back again a bit later, a pair of rufous whistlers with the male singing loudly and the female searching for nest building twigs somewhere not too far away./Socializing with experienced birders while learning and seeing beautiful birds I’ve never photographed./seeing the excitement as heaps of people saw orange chats for the first time./checking the photos when I got home and finding an unsuspected striped honeyeater! What was something that could have been better? Nothing that wasn’t in the lap of the gods…although the lightning was impressive! /The weather. Not your fault/The wind speed on Saturday/The weather, especially Saturday morning. Everything else was great for me./The weather on Saturday afternoon. The wind got to me./With such a large group it might have been better to split up into smaller groups to visit different sites – Goschen was getting a bit crowded /Carpooling organised beforehand//Riverside Caravan Park too noisy but not something that could be anticipated. /A suggestion for future camp outs, only on a volunteer basis, would be to send to all participants the names, email addresses and mobile numbers of those participating.Given the high cost of fuel and accommodation I think we need to foster sharing more. May also help to gain more members./more hours in the day/Everything was great. Maybe weather Sat morning, but can’t complain as it cleared up. 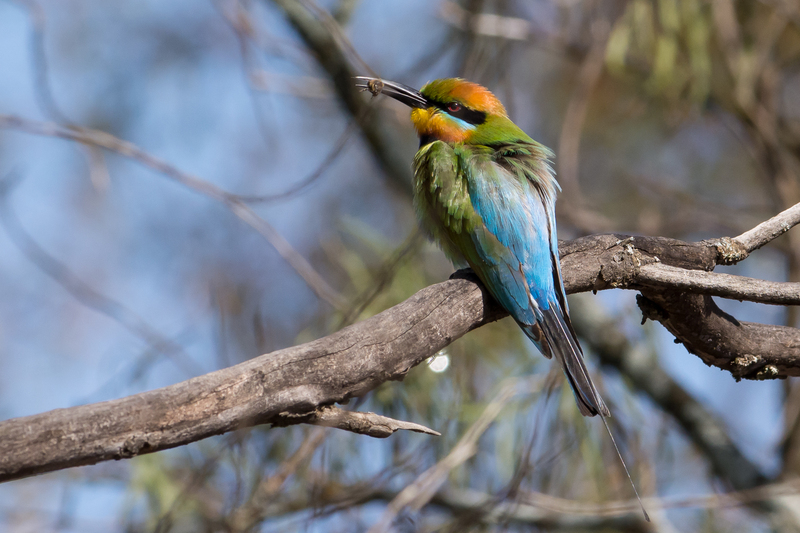 Most would choose the orange chat, but we were pretty impressed with how close we got the Rufous Songlark/Rainbow Bee Eater (x4) (superb colours)/bee-eater – thanks John V for sharing the location/Variegated Fairy Wren/Rainbow Bee-eater. 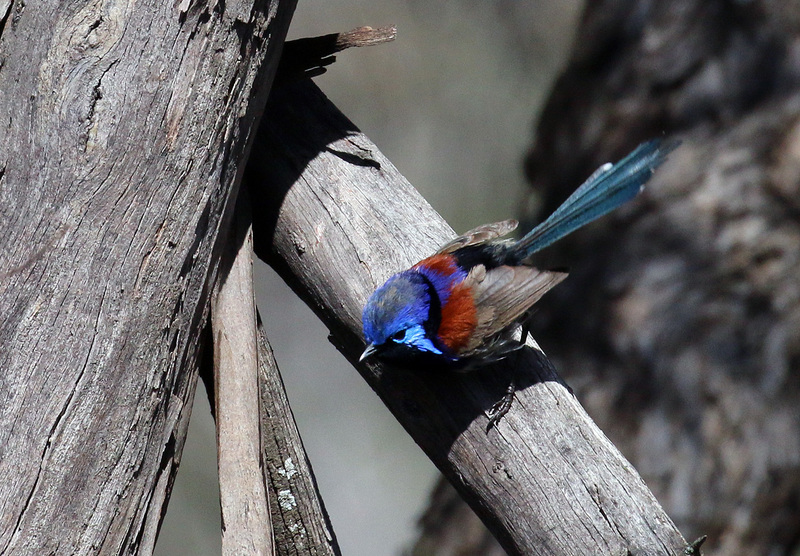 I love them :-)/the Orange Chat (x2) which was new for me/Purple-backed Fairywren (x2)/seeing a male white winged fairy wren in breeding plumage. 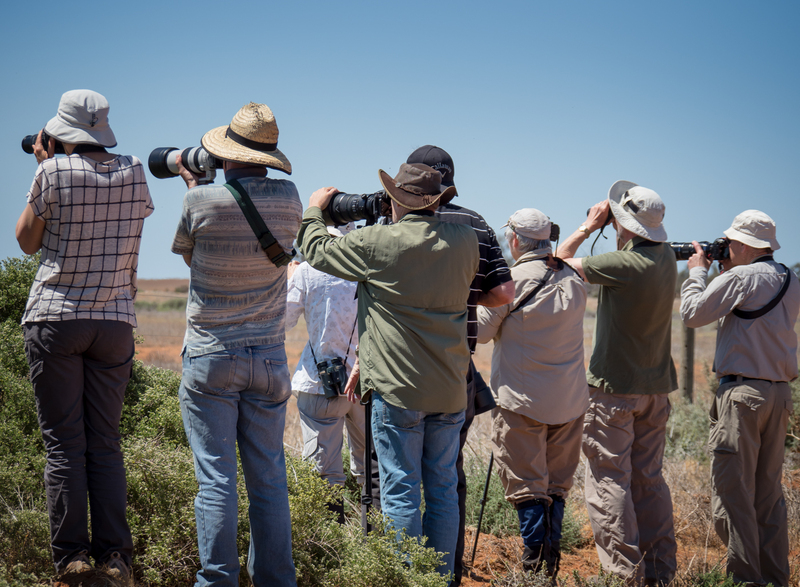 6 super zoom cameras focused on 1 Rufous Songlark….bloody paparazzi! 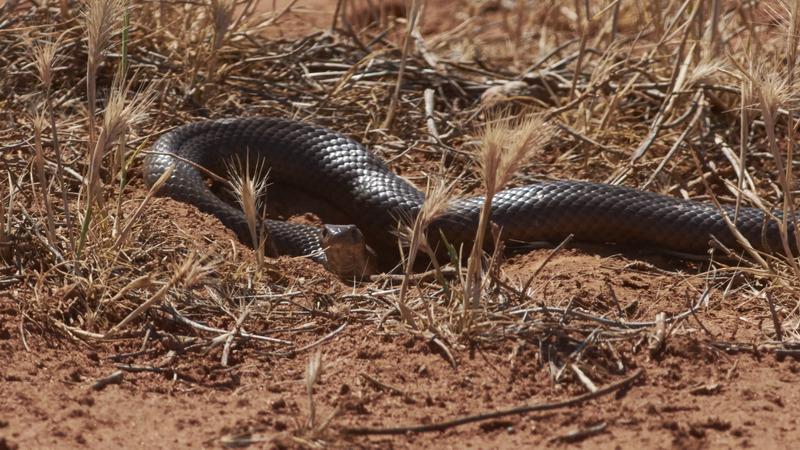 !/John van Doorn and I screaming hysterically when we both nearly stood on the same snake at the same time. . ./My so called favourite bird wasn’t what I thought it was/I learnt that not all is peaceful in the avian world!During the drive up, I saw magpies attacking a feral cat. On the drive home, I filmed some Noisy Miners attacking a goanna. They were savage and relentless. An impression that will stay with you? Super zoom cameras stalking Orange Chats/The Goschen reserve, seen for the first time./sharing of the birding/photography experience by all/Great people who were at least as enthusiastic as me to go out to photograph birds at Goschen despite the thunder and lightning./The lightning show driving to Goschen (x2)/Driving along Lake William Road without much expectation of seeing anything and checking out some small birds that flew up onto the roadside fence and realising it was a male orange chat in breeding colours/30 very excited and focused people lining up along a fence trying to snap a flash of orange/The number of different species at the relatively small Goschen Reserve /Beautiful evening and morning lighting at Goschen./Goschen and a brief visit to Kerang Lakes Ibis Rookery on the way home.This is a place I will definitely go back to. /watching the snake in the orange chat paddock turn away from us /Goschen was amazing and exciting place. How well did the accommodation arrangements work for you? Any suggestions for next time? We stayed at the Paddlesteamer Motel about 3kms out. Fabulous quirky place…..brekky included, big rooms, comfy beds./Fantastic/The Caravan park was fine and clean and we got what we paid for. No complaints./Great place to camp with a tent, so it suited me./Very well/Fine for me at the Big4 riverside but by the time I booked the cheaper options had disappeared/Fine/Staying in caravan park cabin is ideal for me./Tent site much improved when moved from Caravan Park into car park of Goschen./Booked the wrong Big4, unaware there were site two sites but then should be more careful when reading the information emails from Peter./The accommodation was nice and it was good we could walk to the pub for Saturday dinner./something like a school camp where we can be in the bush but still have a range of accommodation to suit everyone? 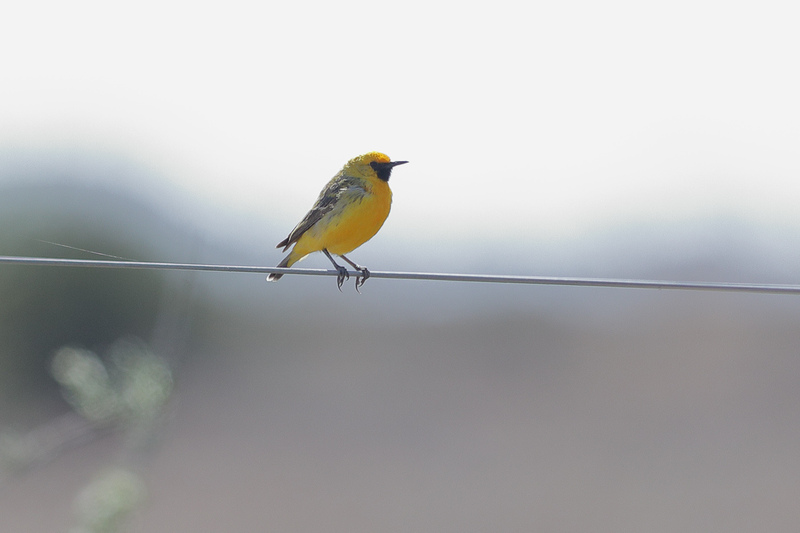 … I could have got a better photo of the Orange Chat! /… I could live without pain../…I brought my earplugs/… I had someone to help identify some of the more difficult the birds I photographed./…every weekend was a birding weekend like this./…the Eremophila had been flowering there would have been even better birding/Nothing – everything was perfect/… the band did not play until 1.00 am on Friday night./… I had stayed with the group for 1 more activity and seen the Orange Chat!/… I had decided to give myself a few more days away in the Swan Hill area./… the loud music we could hear in our cabin till late at night didn’t happen. Great weekend. 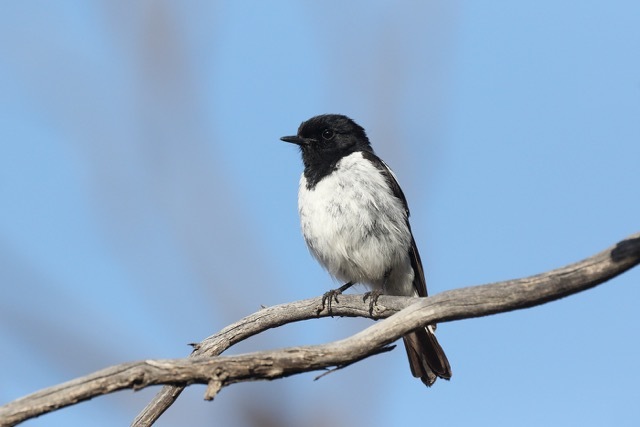 Added a few new birds…Hooded Robin, Orange Chat and great Rufous Songlark photos. Enjoyed the social aspect. Dinner was very good…great spot./Stop supplying chainsaws to the bedrooms. . ./Looking forward to next year and a thank you to the organisers/I know it takes a lot to organise, but there are a lot of people who appreciate the opportunity to go out and take photos with other BLP people. Thanks/Now to start thinking about next year’s weekend outing./None really – a very enjoyable and well organised weekend/extremely well organised event with the right mix of details, flexibility and well-chosen locations/Swan Hill was an ideal destination for a weekend campout.It was fun exploring habitats very different to my own backyard and great to see some new species./Huge thanks to all involved in organizing a truly wonderful experience./As above. Thanks to Peter and John for another great weekend/perhaps use phone app for communication of plan changes/I really enjoyed my first weekend camp out. Thank you! I’m looking forward to joining more outings next year and can’t wait for next camp out. 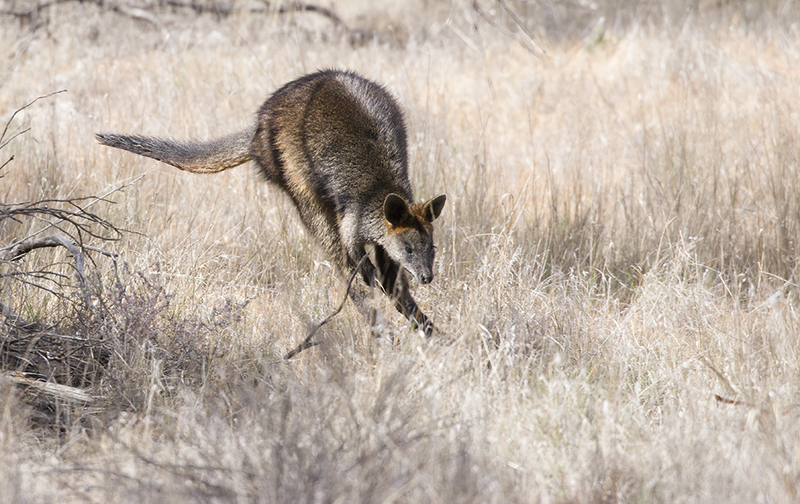 This entry was posted in Goschen, Lake Tutchewop, Swan Hill on November 6, 2018 by blmelbphoto.